The Zyxel Chassis MSAN, IES6100/6000/5112/5106 Series, is equipped with non-blocking Gigabit backplane, failover-enabled Management Switch Cards (MSC), dual input power modules and various high-port density multi-purpose line cards. 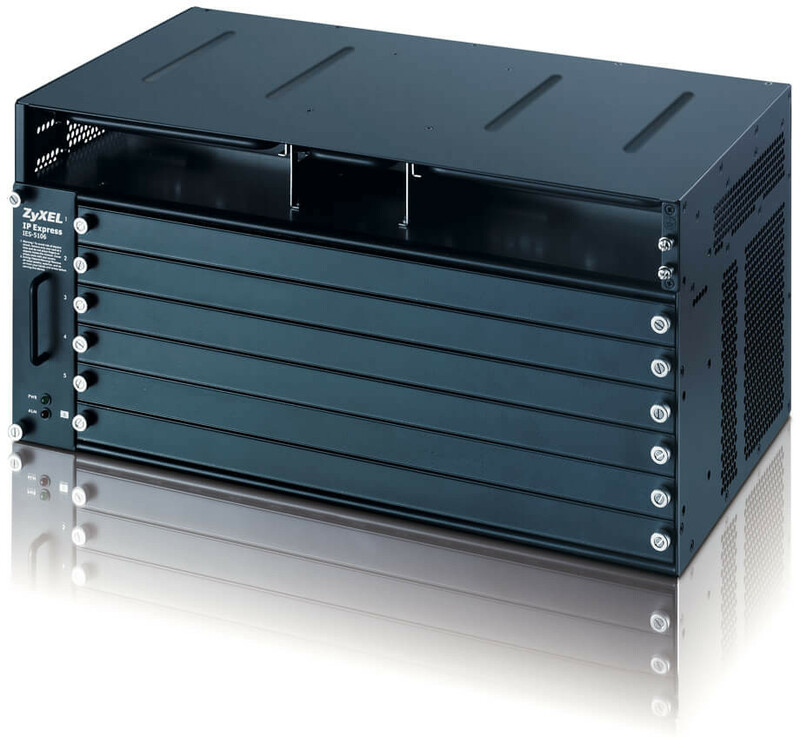 With comprehensive IP-centric firmware features, the Zyxel Chassis MSAN is a high-capacity system that facilitates telcos/ISPs to deliver high-quality residential or business user services experience at competitive CAPEX/OPEX as well as satisfying its current and future infrastructural requirements of reliability, flexibility and scalability for the current and future infrastructure. The IES-5112 Series is an 8U-height, 12-slot chassis-based multi-service access node and the IES-5106 Series is a 5U-height, 6-slot chassis-based multi-service access node capable of adopting the same line cards as those for the IES-6000 systems. The MSC1024GB Management Switch Card with four 1G uplinks is designed to plug into slot 6 and/or slot 7 in IES-5112M and slot 6 in IES-5106M. The MSC1224GB Management Switch Card comes with two 10G and four 1G Ethernet uplinks to support even higher bandwidth requirements. Both MSC1024GB and MSC1224GB are IPv6 capable. The supported line cards include 72-port ADSL2+ line cards that provide subscribers with asymmetric transmission bandwidths of up to 25 Mbps/2.4 Mbps, the 48-port SHDSL line card with symmetric transmission bandwidth of 5.69 Mbps per port, the 24-port and 48-port VDSL2 line cards that offer up to profile 30a (100/100 Mbps) high-speed connectivity per port over copper wires, along with the 20-port fiber-based Gigabit Ethernet line card that supports 1000 Mbps transmission speed per port and 8-port E1 IMA card. The new 48-port ADSL2+/VoIP combo card with built-in ETSI/ANSI POT splitter can be managed by the new MSC1024GC Management Switch Signaling Card. 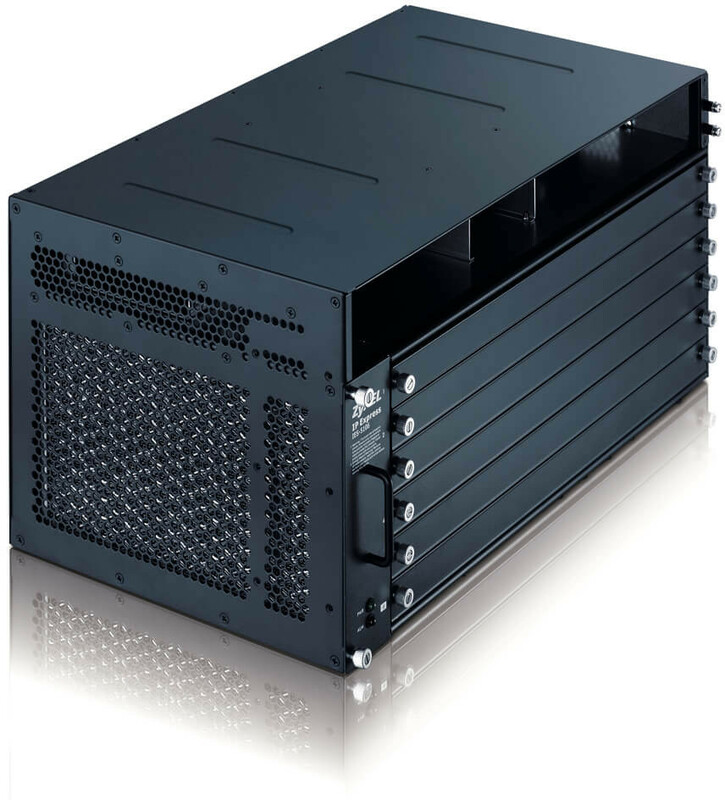 MSC1024GC is able to support IP aggregation for all the combo cards in the same chassis. 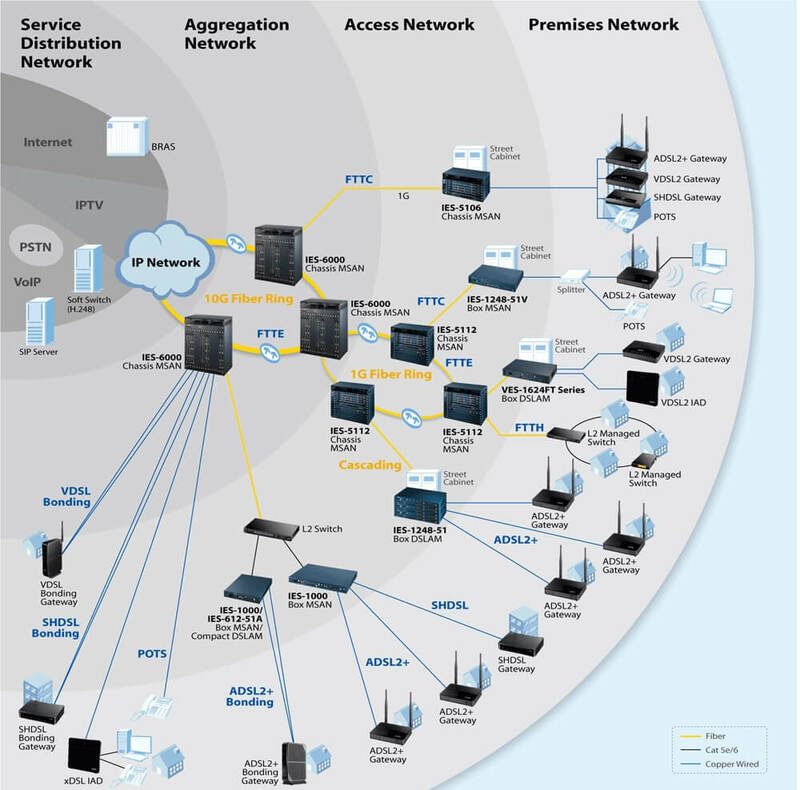 The IES-5112/IES-5106 Series inherits all the Layer 2 and Layer 3 QoS, security and multicast functionalities from the IES-6000, while the following new features are added to satisfy the requirements for massive field deployments: (1) IP bridge functionality that alleviates the Layer 2 access network deployment restrictions resulted from MAC address table limitation and security attack issues; (2) ARP Proxy which minimizes the ARP broadcast requests to all subscribers; (3) TACACS+ mechanism to support remote authentication with TACACS+ servers; (4) VLAN-aware DHCP snooping which adds VLAN information into DHCP snooping tables; (5) DHCP option 82 sub-option 2 for providing remote client ID information to DHCP servers for flexible IP address assignment. The IES-5112 Series supports 1+1 MSC redundancy with a failover switching time of less than 1 second. For both IES-5112/IES-5106 Series, the voltage, temperature and fan speed sensors are fitted into the system. When an abnormal condition is detected, the LED displays and/or the corresponding alarms will alert the administrators of the situation. In case the system temperature rises over the preset threshold, thermal cutoff protection will kick in to shut down the system automatically. The IES-5112/IES-5106 Series provides various management methods: local console port, Web-based configuration, Telnet and SNMP v1/v2c/v3-based EMS (NetAtlas EMS). The management functions include Alarm and Status Surveillance, Configuration Management, Performance Management and Fault Management. Both Series allows multiple administrative accounts with 3-level access privileges. Accounts with the first-level privilege have full access to all management objects on the Management Information Base (MIB). Second-level accounts have similar access rights except creating new administrative accounts, while the third-level accounts are granted read-only access rights to the MIB objects. NetAtlas EMS also provides view-based MIB management that partial MIB objects can be defined and accessed for customization and security reasons. Download the Zyxel IES-5106, IES-5112 and IES-6000 Series Datasheet (PDF). ZyxelGuard.com is a division of Virtual Graffiti Inc, an authorized Zyxel reseller.